For weeks now I’ve been receiving regular, unsolicited e-mails about a new online publication, The Times in Plain English, which is said to contain “content from The New York Times and other newspapers for literacy students, English language learners, immigrants and basic readers.” Yesterday I saw that The Times in Plain English was recommended by a colleague at an adult literacy library resource center, so last night I thought I better take a look. The Times in Plain English claims that they are “presenting articles from The New York Times and other newspapers such as The Washington Post and The Wall Street Journal in an easier to read format.” To me, this implies that they are essentially publishing the same content contained in the original articles they are picking up from those sources. But at least some of The Times in Plain English articles bear little resemblance to the articles they claim to just be simplifying, even to the point of contradicting points made in the original piece. There is very little information provided about the publisher of The Times in Plain English and none about the people who write the articles (there are no bylines), although in the FAQ they acknowledge that the writers have no special expertise in plain language writing. The Times in Plain English has no official relationship to The New York Times, although it has appropriated the New York Times’ masthead font for part of their own masthead, which may suggest to some that there is one. While the people behind The Times in Plain English may have the best of intentions, the issues discussed above (including the unsolicited spam) are red flags. It reminds me that teachers and others have to evaluate online resources carefully, and we can’t just give something a pass just because it’s free or delivered by a well-meaning individual. There are many guides to evaluating Web sites that have been published by schools and libraries over the years which may be helpful in this regard. Here is one, for example, published by the University of Maryland library system. UPDATE 8/16/12: Make sure to read Arthur Schiff’s response in the comment section below. UPDATE 8/17/12: I just wanted to make a few points about Mr. Schiff’s comments. I appreciate his willingness to respond here. In my opinion, the use of “from” and “come from” strongly suggest that the material in The Times in Plain English is directly adapted from those sources, not wholly original content based on multiple sources. Mr. Schiff says that his writers typically “read two or three articles about a topic using one as the source and hyperlinking to another in the text,” and that “[t]he story you use as an example came from two articles in The NY Times and one from the LA Times.” But there was no indication in the piece that the writer was relying on multiple sources—just a link to DeParle’s column. There was no link, or mention, of the earlier New York Times story that Mr. Schiff cites to bolster the accuracy of The Times in Plain English story. No one looking at The Times in Plain English story would have any reason to think that other sources had been referenced. Mr. Schiff acknowledges that “[n]o one doubts there are other factors in inequality,” but you would not know that from reading The Times in Plain English story, which stated a conclusion in the lede that was actually contradicted by the one source that they did cite. In fact, the Plain English story seems to miss the point of DeParle’s column—the one that is cited—which was to dig deeper into the research on the relationship between family structure than in that earlier story had done. As I wrote in the original piece, it is perfectly fine to come to a different conclusion than DeParle or the researchers he quotes, but in that case it’s even more important to be clear that the Plain English story is not a direct adaptation of DeParle’s column. Mr. Schiff did not address some of the other points I made in my original post so I won’t repeat them. But I do want to emphasize again that the primary purpose of the post was not to criticize Mr. Schiff’s efforts, but to model some of the things everyone needs to do when critically evaluating a resource. I did make a point to say that I wasn’t questioning the intentions of the publisher in my post, and now that I know a little more about the way in which articles are put together, I appreciate the effort that goes into it, especially considering that it’s all done for free. My point is not to get everyone to agree with all of my critiques, but to demonstrate the importance of evaluating resources carefully. Dear Jeff: I was a little surprised by the tone of your piece. I think we should be allies working to increase literacy skills. You raise a number of interesting points. Whatever is said in passing, we do not shrink newspaper stories to readable levels. Generally we write them from a fresh perspective keeping our readers’ interests in mind. We cite the newspaper as the source of our information, but not as the final word on the content. We read newspaper articles carefully. They are not always clear or complete. So we sometimes read two or three articles about a topic using one as the source and hyperlinking to another in the text. The story you use as an example came from two articles in The NY Times and one from the LA Times. Economic Inequality and the Changing Family (NY Times). We linked to the last one because it presented the data most clearly. 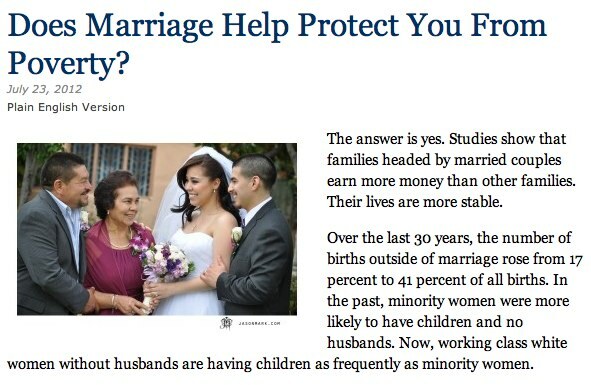 No one doubts there are other factors in inequality, but the thrust of all three articles was on the importance of marriage. I go through this not to rebut, but to describe how we go about our business. We do not change facts or reach conclusions different from the intent of the articles. We will go to some lengths to make them readable. I hope this helps. And that we can work together toward our common goals. Arthur, I’ve updated my post in order to respond to some of your comments. Thanks for responding.